A notable name in Hindi, Telugu and Kannada cinema, actress Meghna Naidu made her Tamil debut in the 2006 film, Saravana, which had STR and Jyothika in the lead roles. Having starred as in a vital role opposite Simbu, the film went on to become a success at the time of its release. Since then, Meghna Naidu had also made special appearances in many Tamil films including featuring in songs and landing an important role in Simbu’s father, T. Rajendar’s Veerasamy in 2007 and will next be seen in a song in the upcoming Yogi Babu starrer, Dharma Prabhu. Meanwhile, Meghna Naidu has now announced that she had gotten married to a Portuguese tennis player named Luis Miguel Reis, which the two have kept as a secret for nearly two years now. 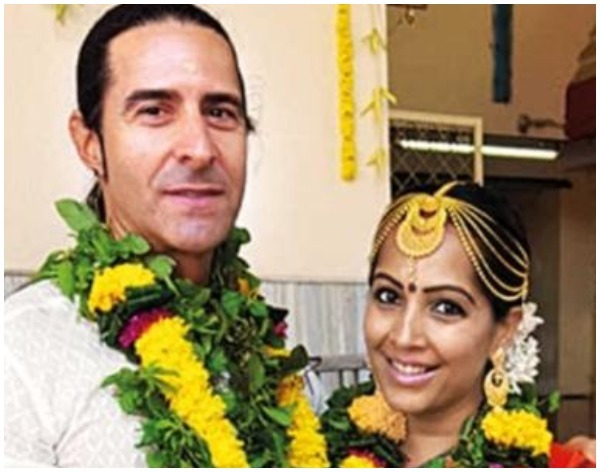 It has been revealed that Meghna Naidu and Luis Miguel Reis got married on December 25, 2016 at an Ayyappa temple following a relationship for nearly eight years. Luis, who is 10 years elder than Meghna, was a coach and the two had met 21 years back after which they began dating before drifting apart and then rekindling their relationship again. >>Watch the teaser of Yogi Babu's Dharmaprabhu! >>WOW: Janani Iyer does this for Yogi Babu! >>Exclusive Update On Yogi Babu's Next! >>EXCLUSIVE: Big Update On Yogi Babu's Dharmaprabhu!